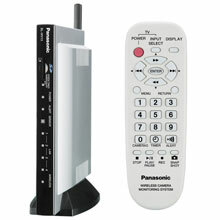 The Panasonic BL-WV10A has been discontinued. No direct replacement is available. With the Panasonic BL-WV10A you can move the camera lens in the direction you want to see by pressing the cursor key on the remote control or even access your favorite angles by using the preset controls (numbers 1-8). This simple remote control lets you operate the camera right from the TV, without having to move the camera by hand.